It may lack the glitz and glamour of Hollywood but south west London has become the destination of choice for a host of award-winning TV and film shows. High-profile productions such as Law and Order UK, Psychoville, The Apprentice and Misfits have descended on the London borough of Sutton and nearby Merton in recent months. A diverse range of locations in Sutton - from a large pedestrianised town centre, to numerous parks as well as spectacular lavender fields - have been cited as reasons for the filming boom. Word of the borough's facilities has since spread, with Sutton Council receiving enquires from location managers on Hollywood blockbusters such as X-Men 4 and Pirates of the Caribbean 4. 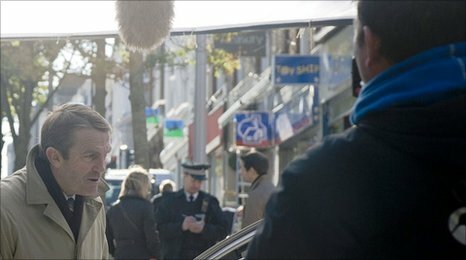 Harriet Lawrence, location manager of E4 comedy, Phoneshop, which was filmed entirely in Sutton, acknowledges the borough's proximity to central London. "There is huge array of different styles of housing from flats and council estates to large detached Victorian houses, a great high street and some fantastic parks," she says. "It really does seem to have a bit of everything." The upswing in filming follows the blow dealt to the area when the ITV police drama, The Bill, was cancelled in March after 27 years. The studio where the series was filmed has now reopened as Wimbledon Studios and is plying an impressive trade, with the new series of Channel 4 comedy Peep Show being made there. A pioneering 3D company, Pro3D, has also set up shop at the studios. The surge in activity comes as no surprise to Adrian Wootton, chief executive of Film London. "I am delighted film-makers and producers are discovering a somewhat untapped part of the city in south London and the newly reopened Wimbledon Studios. "It can only add to the richness of what the capital has to offer and long may it continue." "This is a very exciting time," adds Jayne McCoy of Sutton Council, "bigger and bigger productions are coming to the area. "As well as the money [to be made] by hiring out their premises, Film London studies show that, for every £1 spent on filming, production crews spend an additional £2.50 in the local area." Other productions such as a new John Hurt BBC drama, due to air over Christmas, Channel 4 comedy the IT Crowd and From Time to Time, a fantasy film starring Dame Maggie Smith, Timothy Spall and Hugh Bonneville have also filmed in the borough.